When ordinary postcards are just not cutting it, you need raised spot UV postcards. Raised spot UV postcard printing allows you to emboss specific areas you specify so they’re more prominent. Use this effect to highlight your business logo, hero images, or contact details. Make your postcards really stand out with raised ink postcard printing. Raised spot UV postcards are printed on 16 pt. Cardstock, one of the toughest we have to offer. At half the thickness of a credit card, this material will not fold easily. Because of its thickness and premium feel, these are best suited for promoting high-end products and services. Spot UV does not have any effect on colors. In fact, there are no limits to the colors you can print. Even photos can be embossed if that’s what you want. We offer two postcard sizes: 4” x 6” and 5” x 7”. These sizes are both mailable and make postcards the ideal marketing tool for door-to-door campaigns. Some of our customers even use them as discount cards on occasion. 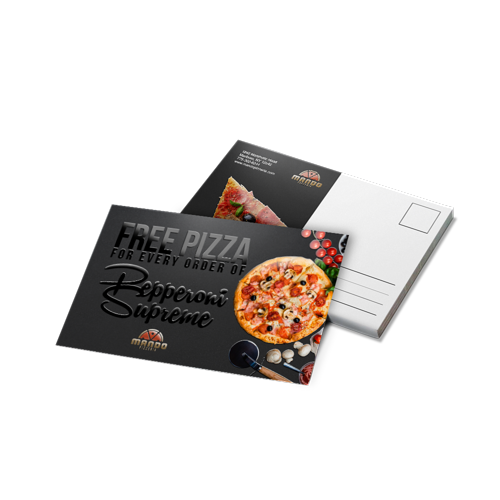 Print raised spot UV postcards to promote your restaurant or cafe. Have them handy during conferences and trade shows. How you use them is completely up to you. It refers to the number of business days it takes to print your custom postcards. Shipping time is not included. What’s the more popular size option between the two? More customers go for 4” x 6” postcard printing. Do you offer raised spot UV folded postcards? No. We don’t offer raised spot UV for folded postcards at this time. Can I add raised spot UV on the back of the postcard? Yes. However, we’d recommend you avoid adding spot UV to the back of the postcard if they’re to be mailed.